Tahitian lime, sugar, Cachaça Ypioca, shrimp, dende oil, coriander, coconut milk, peppers, tomatoes, eggs and dry coconut. With these ingredients in your basket, you already feel the sun of Bahia and the beach of Pousada Capitù very close to you. In Brazil, all parties begin with the inevitable Caïpirinha! A true institution at Pousada Capitù, this fruity cocktail symbolizes samba and football at the same time, its 100% part of Brazilian culture. 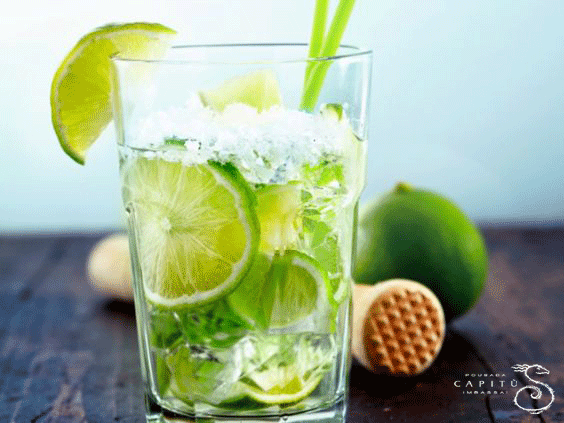 Serve it with a straw and a slice of lemon on the edge of the glass, the Caipirinha Pousada Capitù way is ready. 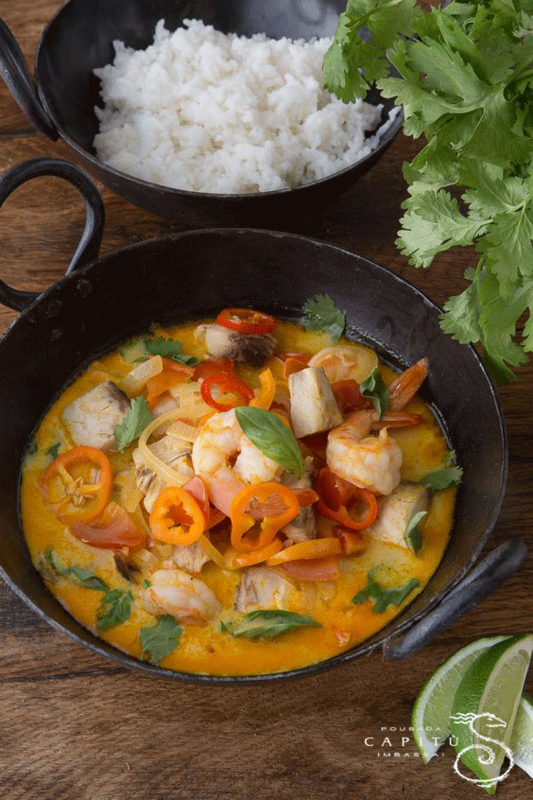 To continue our journey of Bahian flavours, Sylvana suggests the "Moqueca de Camarão" a traditional Brazilian dish from the State of Espírito Santo and Bahia. There is a wide variety of moquecas throughout the country, with fish, shellfish or vegetables for vegetarians. At Pousada Capitù, our favourite recipe is the one with shrimps! Hmm, it's a delight! In a large skillet, pour in the olive oil and the garlic. Add the onions, tomatoes and peppers. Soon after, add the palm oil and cook on a low heat for 3 minutes. Finally, add the coconut milk and simmer another 5 minutes. You can serve with white rice and some coriander leaves in decoration, the Moqueca de Camarão Sylvana’s way is ready. 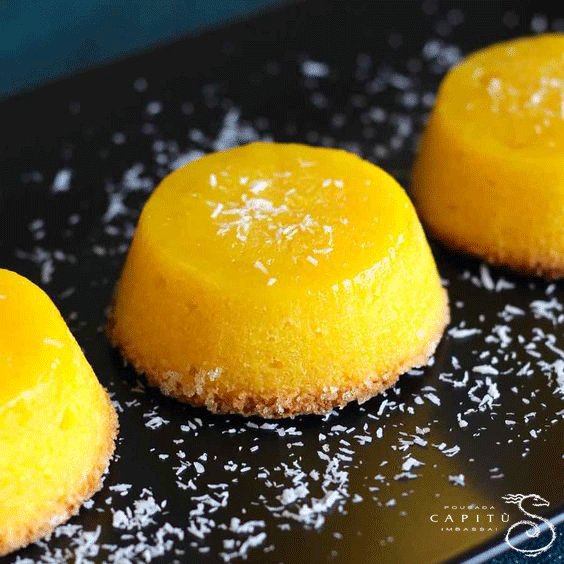 After the traditional dish, the Brazilians finish their dinner with the Quindim, a Brazilian dessert from Portugal. For the record, in Portugal, it is cooked with almonds but it is when it arrived in Brazil, in Bahia more exactly with the colonists, that the almonds were substituted by coconut, easier to find here. Especially at the Pousada Capitù with our 80 coconut trees. Family-friendly, light and above all easy to do! In a bowl, cover the 100 g of coconut with the 200 g of warm water and allow the coconut to absorb the water for about 5 minutes. In a blender put 400 g sugar and 50 g butter. Add the rehydrated coconut and water if not all absorbed. Add the 12 egg yolks and mix for a long time to obtain a homogeneous mixture. Butter the moulds and pour a bit of sugar inside. Fill the moulds to the top. Place the moulds in a larger container and cook them in a “bain-marie” in the oven. Bake at 180 ° C for 50 minutes. During cooking, the coconut will "float" on the surface of the preparation. Take the moulds out of the oven; allow them to cool completely down to room temperature before unmoulding by carefully removing the edges with a knife. Let them chill for about two hours. You can if you wish to sprinkle the quindims with grated dry coconut. Here you are, ready to prepare a traditional Bahian meal. Simple ingredients that reflect our food and way of life: Tasty, in colours and in music!